More Info: Bright red foil and small accents of green foil help to create this wonderful illustration. Made in USA. 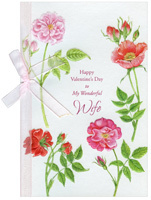 More Info: Gold foil vines adorn the heart and accent the small boxes on the front of this Valentine's Day card. Embossing on the front cover creates a 3 dimensional look and feel to the illustration. Printed on Recycled Paper. Made in USA. More Info: Gold foil lettering and thick gold foil borders on the heart images create a great contrast to the simple pink background image. Made in USA. More Info: Features gold foil lettering and accents on the hearts. Made in USA. Inside: To a couple who shares life's everyday joys! 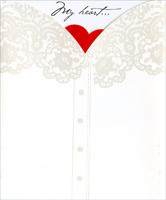 More Info: This wonderful Valentine's Day card for your son is loaded with embellishments and incredible design elements. Attached to the simple deep blue background is a die cut panel of blue water, a pink and orange sky and bright pink branches. Surrounding the die cut panel is a thin line of gold foil. Layered on top of that panel are two gold ribbons that run from the top to the bottom of the card and underneath a die cut circular tip on banner that holds the front verse. Two thin gold foil circular lines run along the outside edge of the circular banner that's also adorned with reflective silver sequins. Spot UV treatment is used to create a shiny, raised up or textured look to the white text and the pink, blue and white branches. The interior of the card features a die cut insert and a thin gold foil trim around the die cut edges of the insert. All of these wonderful embellishments combine to create a truly incredible looking card that will be remembered for a long time. Extra postage required. 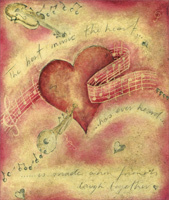 More Info: Gold foil outlines and frames each heart creating a great contrast to the deep brown heart illustrations. Made in USA. More Info: This card features gold foil lettering on the front. Made in USA. More Info: Vibrant foil makes the lettering, rainbow, and heart leap off the white background. Made in USA. Inside: Thinking of you today and hoping that life is being good to you… And sending a loving wish for a Happy Valentine's Day, too! Inside: …because you're you! Happy Valentine's Day! 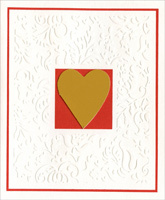 More Info: Thin foil accents each of the heart illustrations along with the lettering on this simple but wonderful card. Printed on Recycled Paper. Made in USA. Inside: …friendly conversations, warm smiles and lingering laughter. Happy Valentine's Day! 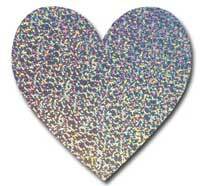 More Info: Features gold and silver foil outlines on the heart illustrations. Printed on Recycled Paper. Made in USA. More Info: Thin gold and silver foil borders frame the hearts while a die cut heart shaped window reveals a single heart illustration on the interior of the card. Made in USA. More Info: Features and embossed (raised up) white frame around the main image. Printed on recycled paper. Made in USA. Front: Daughter When I count my blessings..
More Info: Features shimmering glitter on the roses and purple foil lettering. Inside: That's why you came to mind! 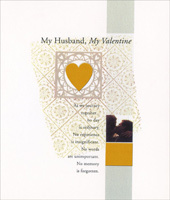 More Info: Silver foil lettering and a die cut heart shaped window are featured on the front of this card. The interior heart design can be seen through the die cut window. Made in USA. Inside: A six-pack of love! Front: Grandma, we think you're the sweetest!